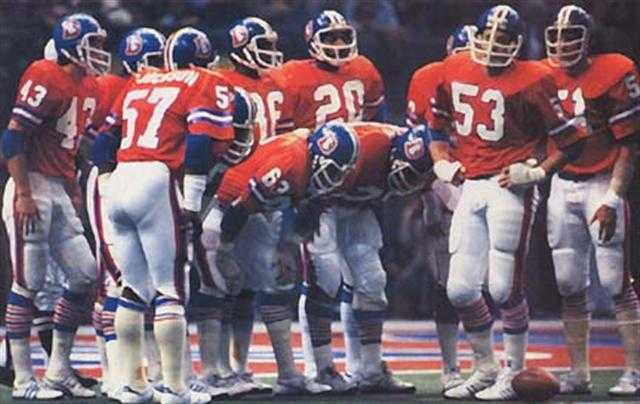 The 'Road Warriors' Broncos are on the road yet again after getting the victory against the Chargers. The Broncos this week are taking on the Vikings who have a record of 2-9 and have struggled so far this year. This is a game that the Broncos are expected to win, which would be a first for them this year. 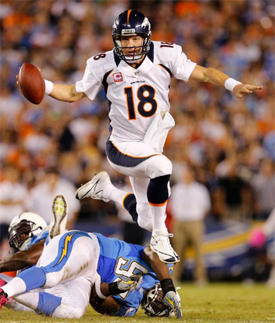 The Broncos should not underestimate the Vikings as every win is crucial to the Broncos playoff hopes. Time to get into the preview. Tebow Time, baby! Come on now. Fantastic finishes. Read-option football. The Broncos are trying to ride it to a division title. Are you on board? This could be a long week for Christian Ponder. Elvis Dumervil is back in peak form and rookie Von Miller is a track star out there off the edge. And with the Vikings possibly without Adrian Peterson again, ball control might prove difficult. Percy Harvin will continue getting carries and will be featured big in a gadget role. There are some really good match ups for the Broncos in this game but there are two keys for me in this game. Number one is AP. 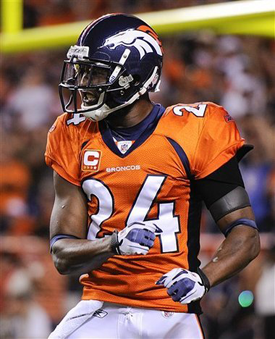 The Broncos front seven have to stop AP and limit him to less than 100 yards. We may be helped out with this as AP has an ankle injury and may not play. But if he does we will need to shut him down. The second is Jared Allen. Even on a bad team he has been a monster and has great numbers. He could make Tebow's day a nightmare. We need to block him and take him out of the game. If we can do this I think we can come away with the victory. Other match ups, Champ Vs Harvin, Champ has to shut him down. 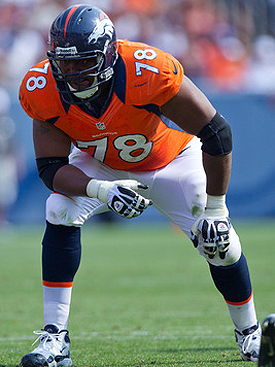 If this is done Von Doom (if he plays) should be able to get after Ponder and make his day a living hell. Make him Orange and Blue! Storming Mormon needs to get a few touches as always to take a bit of pressure off Tebow and McGahee. As always a word on Tebow. He is going against one of the worst secondaries this week and needs to have a good showing. I ask for 10 or more completions and 50% completion rate. I don't ask much and I think he can do it. 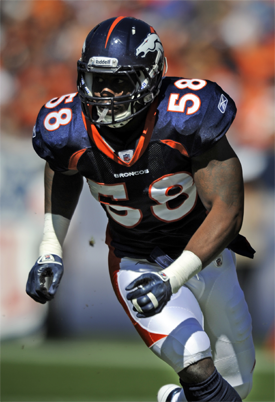 The NFL has honored Denver linebacker Von Miller as its defensive rookie of the month for November. Miller tied for the team lead with 31 tackles, 4.5 sacks and two passes defensed as the Broncos went 4-0 during the month and became a playoff contender. Miller, the No. 2 overall draft pick in April, became a dominant player this month as Denver’s defense improved dramatically. Miller was drafted to help a defense that was No. 32 in the NFL last year. It is currently ranked No. 16 in the NFL. This likely won’t be Miller’s last rookie honor. He is considered a leading contender to win the NFL defensive of rookie of the year award. Harvard students set out to statistically prove the “Miracle of Tim Tebow” for Broncos, link. Photos from Practice at the Dome, looks like DJ is balling! 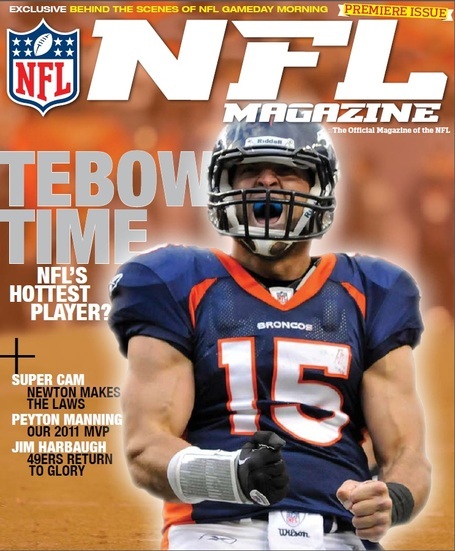 This is pretty cool, Denver Broncos QB Tim Tebow to Grace Debut Cover for NFL Magazine. Check the picture out below. Denver Broncos star rookie linebacker Von Miller took another step toward not playing Sunday at Minnesota as he failed to practice for the second straight day. He had surgery Tuesday to repair ligaments in his thumb. Miller suffered the injury Sunday at San Diego, but he finished the game and made a huge play near the end of overtime to help the Broncos. Denver coach John Fox didn’t shed much light on Miller’s status for Sunday against the Vikings. Perhaps this is a positive: Fox said Miller is in the process of getting medical protection gear. It will likely be in the form of a hard cast or hard splint. Also for Denver, running back Willis McGahee (illness) and receiver Eddie Royal (toe) were both limited Thursday after not practicing Wednesday. I have a feeling that all three will play but both Royal and Miller will be limited. Miller will probably only be used in pass rushing situations and Royal will probably only get out there in 4 wide sets. I expect to see a lot more of D-Thomas. If Miller doesn't play then Haggan will slot into his position. The Broncos don't score a lot of points and I expect that is the case in this one. 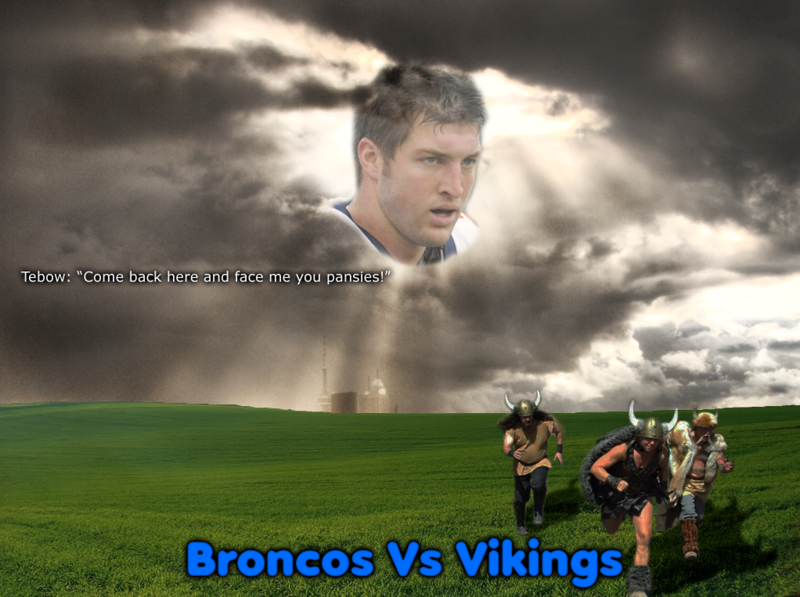 The Vikings don't have a very good defense so I am expecting the Broncos to try somethings and score some points. I say a 24-14 game Broncos win. Q: Why did the National Hockey League allow Minnesota to get a franchise? A: The fans were crying to have at least one professional team in Minnesota. That's it from me, enjoy the game and your weekend. Go Broncos! ~ Aussie. Stormin' Morman must be Larsen. How do you know he's Morman? Rob Rang has an underrated prospects list out. I am not sure, I think I heard it some where else, someone else used that nickname and I have been using it since. If I remember where I will let you know. As for prospects I haven't even started looking, riding the high of this season so far. Yeah I wasn't looking. Just saw the link on the Daily Lard. IMO we need to get young backups at CB and RB and still need to address the DT position. Thomas and Bunkley are doing good. Vickerson and Warren should be back too. Fangupo was at USC and transferred. He's a Samoan looking dude and did mission work in Philippines. Just what we want. He's only 6'1" 310, but is said to be very good against the run. We can have him in the 3rd or 4th probably. You can never draft to many OL, IMO. I want a CB in the 1st round this year(Dre Kirkpatrick, Chase Minnifield are my favorites 'cause I don't like short CBs), but Wade later would be OK with me. I agree with you on the cb and rb, I think that will be our picks in the first two rounds next year. But like I said enjoying the high at the moment, can u say playoffs! I can say leading the AFC West by better division record than the Raiders right now. I can say I called the Miami win and our emminent lead. I can say we should be favored next week hosting the Bears without Cutler and possibly without Forte. I can say Oak will lose at GB next week more than likely. I can say we are in the driver's seat. I can say that one day I said there was no way we lose 3 straight and SD wins 3 straight to knock us out of the playoffs and into one hell of a tailspin. Haha nice digger, I am hoping we don't collapse in a heap to end the year, 11-5! :) I would like that. I think 9-7 and division winners. We host a playoff game at Mile High. Win. Go on the road. Win. Make the AFC Championship game. Lose. Sorry if that wrecks your dreams. I hope I'm wrong and we win the SB. So would I, yeah think 9-7 is realistic, we may sneak in an 10-6 but I doubt we go unbeaten for 4 weeks, I think we beat everyone but the Pats (even though we are their kryptonite). I like our chances in the playoffs but could we beat teams like the 49ers or Packers? I doubt it but we have a lot to build off now. I will be happy with just playoffs for the first time in years. What a game!!! I'm really liking my 10-6 prediction right now, very real possibility. Anyway, I've started the post game but will have to finish it tonight or definitely tomorrow. Got to work tonight so may be too tired to finish it today. It will be up soon. Nice Princess, I was going to watch the game but I had used up all my internets. And cool whenever you can get the post game up that would be great.